Most of us know that in addition to an annual MOT, our cars need to undergo a service at least once a year. But what is the difference between a standard (interim) and comprehensive (full) service and why do our cars need them? Unlike an MOT, car servicing is not a legal requirement, but they are vital to the continual use and health of your car. A service is there to ensure that most of the perishables that are needed to help your car run (oils, filters and fluids) are kept fresh and in good condition, making sure that your car stays healthy and running properly for as long as possible. A car service is a form of preventative maintenance for your car; annual servicing can help prevent lasting and expensive damage from building up over time. These checks also help to ensure that your car runs as smoothly and efficiently as possible, meaning that you aren’t wasting petrol or causing your tyres to wear prematurely. ATS Euromaster offer servicing at over 250 centres across the country with morning and afternoon slots available with our expert technicians. ATS Euromaster provides a choice of standard and comprehensive car services, depending on your car’s usage. In addition to the standard fluid and perishables that you might expect to be changed, our highly skilled technicians carry out a series of additional tests and checks to ensure a lengthy life for your car. 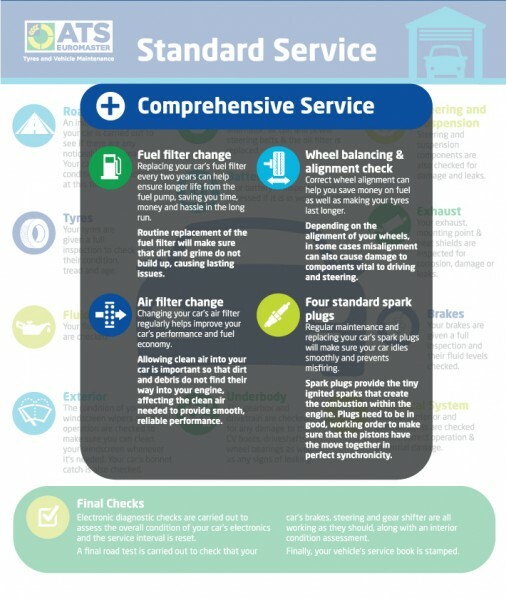 ATS Euromaster recommends that a standard service is carried out on your car annually or after 10,000 miles, whichever one comes first. 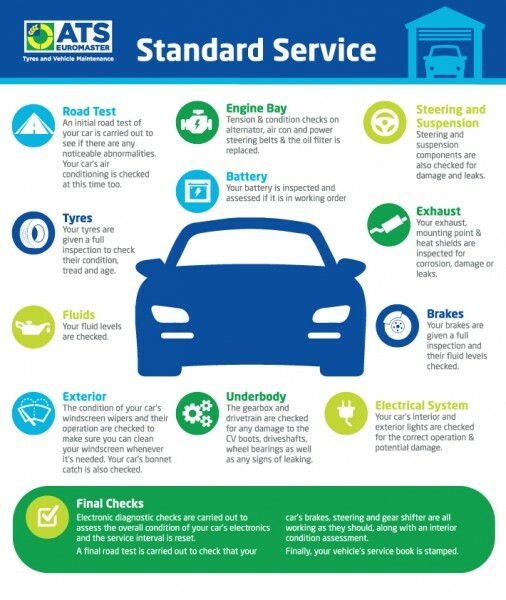 The standard service includes all of the vital checks and services that your car needs to annually, such as oil, clutch fluid and brakes checks. The standard car service at ATS Euromaster comprises of a 50 point check/ service which is suitable for drivers that cover short, urban journeys as well as drivers that cover long distances. Annual comprehensive servicing is recommended for high mileage drivers, however comprehensive services are still recommended for low mileage drivers every other year (or 20,000 miles), with a standard service in between to ensure your car keeps running smoothly. The comprehensive service comprises of 55 main checks, including all of the vital checks and services included under the standard service, as well as replacement of fuel and air filters, a wheel balancing check and up to four standard spark plugs. Long life spark plugs can also be fitted at an additional cost if required. -Fuel filter change: Replacing your car’s fuel filter every two years can help ensure longer life from the fuel pump, saving you time, money and hassle in the long run. -Air filter change: Changing your car’s air filter once it gets dirty can help improve your car’s performance and fuel economy. -Four standard spark plugs: Regular maintenance and replacing of your car’s spark plugs will make sure your car idles smoothly and prevent misfiring. -Wheel balancing & alignment check: Correct wheel alignment can help you save money on fuel as well as making your tyres last longer. At ATS Euromaster we use parts of matching quality to the OEM components as specified by your vehicle’s manufacturer, so your car can have that ‘factory fresh’ feeling and you can be safe in the knowledge your car has serviced with the right quality parts by highly-trained experts. To ensure full protection of your vehicle’s warranty we advise that you fully check the Service Package provided by ATS Euromaster to make certain that your car’s warranty remains unaffected. What engine oil should I use with my car? Oil is one of the single most important things to regularly check on your car, This is why it pays to use a high quality engine oil that protects your car while providing performance and economy. At ATS Euromaster, we offer Mobil oil as part of Vehicle Services. We supply a range of superior, high quality Mobil oils and lubricants to clean and protect your engine and improve your vehicle performance and engine life. Good quality oil keeps the moving components within the engine able to move freely at the correct speeds and allowing the pistons to maintain the healthy rhythm needed for your car’s engine to work properly. As with any other liquid, oil is affected by time, heat and constant use, making it become a thinner, dirtier liquid that doesn’t provide the engine with the protection required. If left long enough without fresh oil, your engine can seize, rendering the engine unable to function at all. How often should I change my car’s air filter? Having clean air enter your car is hugely important to how the engine operates. Air needs to enter the engine to aid the combustion that makes your engine work. For every gallon of petrol used, a car uses up to 10,000 gallons of air, which passes through your air filter and into the engine. Through general usage your car’s air filter gets dirty and filled with things that hinder it working properly; this is especially true if you live in a particularly dusty or sandy area. The more dirt in your car’s air filter, the less clean air can make it into your car, causing your engine to perform slugglishly. In the real world this means that you may find you get get less performance out of your car while also getting worse mileage. Correct wheel alignment is important to your car’s performance, both in terms of how well it drives and economically. Your wheels can go out of alignment through everyday usage but commonly it happens as a result of shocks to your car’s suspension caused often caused by driving over potholes or ‘curbing’ your car at speed. Having misaligned wheels can increase rolling resistance for your car, forcing your car’s engine to work harder and use more fuel as well as affecting performance. You may also find premature wear on your tyres as a result from a wheel which has gone out of alignment. A wheel alignment check is included with comprehensive services at ATS Euromaster, with the option available to have the balance & alignment adjusted if needed. Wheel alignment checks can also be carried out for free when you buy new tyres with us. Why do I need to change my car’s spark plugs? Spark plugs are one of the components in your car that you don’t really notice until one stops working. In most cars, each cylinder is served by a spark plug, which creates the small spark needed to ignite the small explosions needed to power each cylinder. If one or more spark plugs fail you will most likely experience symptoms such as decreased engine performance, misfiring and a rough feeling from the engine when it’s idling. While some manufacturers of spark plugs say that their plugs will last for 35,000 miles, it is recommended that your spark plugs are changed every 20,000 miles or two years to ensure that your engine keeps running smoothly. Why Book an MOT and Service at the Same Time? While not a legal requirement, having your car serviced can help it pass its MOT, since many of the areas covered are assessed in the MOT. Many of the checks carried out by ATS Euromaster in our Standard and Comprehensive Services are perfect for helping your car pass its MOT; areas covered by our expert technicians include (but are not limited to): tyre inspections, interior & exterior lights, horn & wiper blades, all of which are checked in your MOT and can be a cause for failure if not in good, working order.